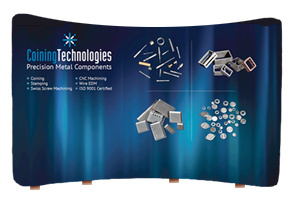 Coining Technologies was so pleased with the website that BZA created for their company that they contracted with BZA to develop graphics for their new Trade Show booth. BZA was able to leverage the look and feel of the website into the trade show graphics. Not only did this save the client time in working with one company but this client realized an approximate 50% savings on design costs. Just heard about a web site on Facebook called Spoonflower The site allows you to upload an image and have it printed on fabric. You can choose how you want your image to be repeated and even order a sample swatch. If you want to learn more make sure you check out their blog and view the YouTube Video which describes how the site works. Great for event marketing, trade shows, promotions, etc. Very cool stuff. Yesterday we exhibited at the North Jersey Biz Expo that was held in Whippany, New Jersey. Like all good marketers we planned ahead of time and designed a new banner, ordered our printed materials and give-a-way items for the booth. As a creative firm we like to demonstrate our creativity in everything we do. So when it came to coming up with an idea for the booth all I had to do was too look to our web site. On our home page we use a peacock feather as a unique graphic element. So the idea was born. A big beautiful glass vase filled with peacock feathers was destined to be in our booth. Taking the idea a step further, I thought, let’s give out peacock feathers. We designed a hang tag about the size of a business card and attached each one to a feather. The feathers were about 36” long. We gave them out and people loved the idea and more people began coming up to our booth asking for a feather. The feathers were noticeably visible as people walked around the exhibits carrying these long beautiful feathers. It actually created quite a buzz. It goes without saying; everyone was tickled to have one.